Winter layering doesn’t have to be frumpy and shapeless when it’s done right. When you put thought into how you layer your clothes in the colder months, you can ensure that you will look just as chic out and about as you do when you peel off your layers indoors. This Karl Lagerfeld inspired outfit illustrates how you can layer stylishly and smartly (and still keep toasty while you’re at it!). This ensemble is a sartorial fusion of the antique and the contemporary, and a stylish juxtaposition of masculine and feminine. The ruffled collar of the white blouse is a contemporary nod to the menswear of the 1800’s. Along with adding a facet of drama to the otherwise basic white shirt, the high neck is also a practical aspect as it keeps your neck shielded from the cold. The androgyny continues with the addition of the vintage embroidered waistcoat over the shirt, which compliments the white with its muted shades of cream and grey. The light grey military coat is the perfect topper to this winter outfit, as its neutral colour is a refreshing substitute to winter’s default black. Black leggings are a trans-seasonal wardrobe staple that never goes out of style and can be teamed with virtually anything. Here, they balance out the heaviness of the multiple top layers and cut a fashion-forward sleek silhouette. The black patent riding boots are the ideal choice of footwear for wet and snowy climes as they are waterproof and comfortable. 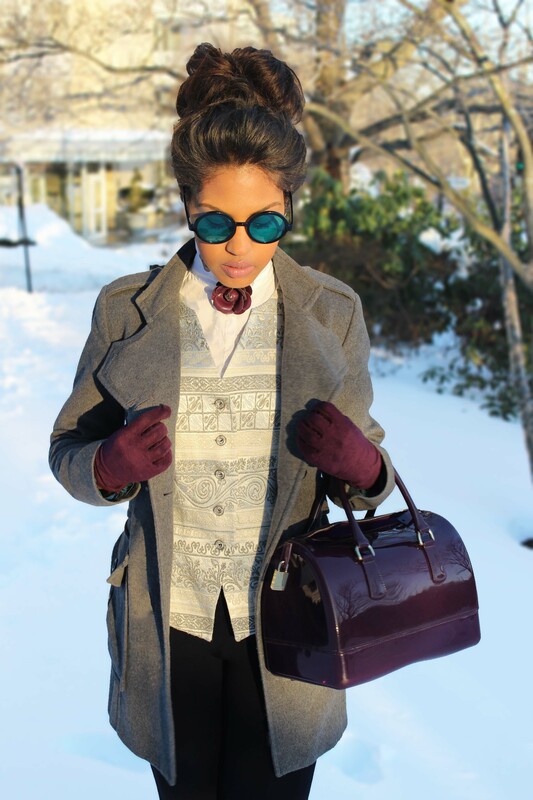 The burgundy gloves, maroon brooch and purple bag are finishing touches that add a rich a pop of colour to this otherwise neutral ensemble. These standout accessories also balance out the masculine elements by adding a distinctly feminine feel to the look. 3. 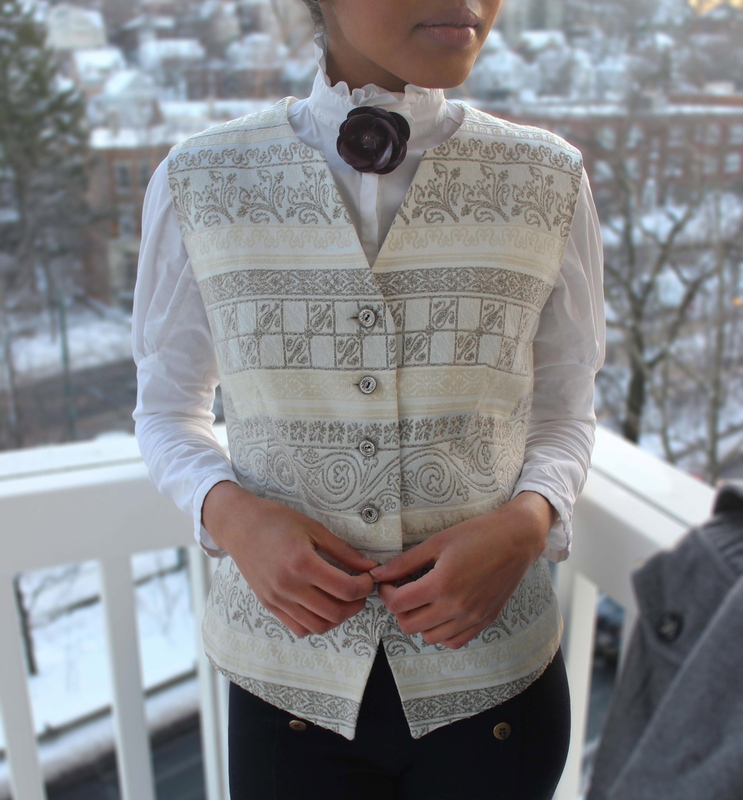 Waistcoat: Mom’s Closet (vintage). 4. Horse Riding Leggings: Zara. 5. Jelly Bag: Furla, available here. 7. Blue Shades: Camden Market, similar here. Love your unique take on layering fashionably. You are officially now my new favorite stylist! I LOVE this outfit!!! 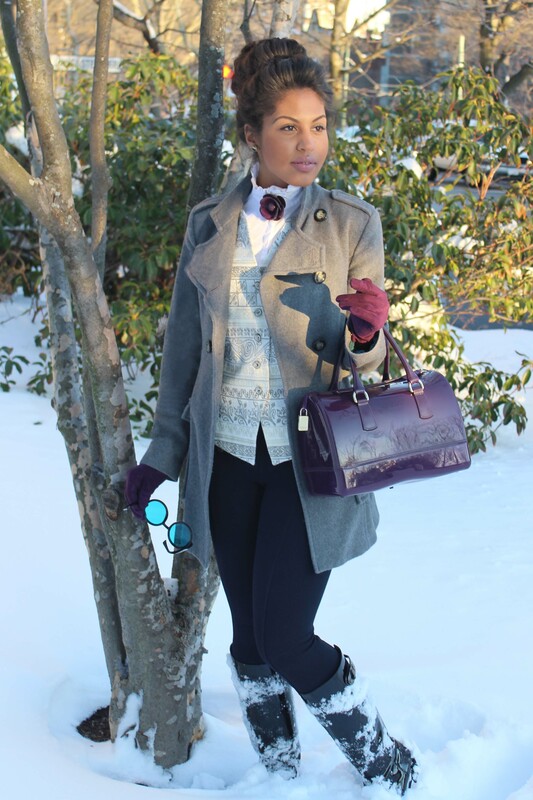 Sorry to leave several comments….but would you be interested in doing a style profile for my Harvard fashion blog? I’d love to photograph you in 3 of your favorite outfits…. I love your style, and I love that do fashion with a cerebral twist.